A hard job just got easier! Eliminate bending and struggling when putting on heavy-duty compression stockings and pantyhose. Simply stretch the sock, stocking or pantyhose over the column and insert your toes. Pull on handles with a continued stepping motion to place the sock on or up to the knees for final positioning. This sturdy helper is made of steel with a smooth plastic coating. Strong enough for surgical stockings and pantyhose. Included is a 2 oz. bottle of our Support Plus Hosiery Wash. Who better to make a hosiery wash than those who know it best? Support Plus ! Our hosiery wash is formulated to effectively clean and refresh your hosiery. Just hand wash for 15-30 seconds then hang or lay to dry - no rinsing required. Support Plus No Rinse Hosiery Wash is gentle on your delicate hosiery and, because there's less agitation and zero rinsing, your expensive hosiery can last much longer. Support Plus No Rinse Hosiery Wash is also great for other delicates. No-Rinse formula. Helps expensive compression hosiery last longer. Completely cleans hosiery in less than one minute. No heavy perfumes - just lightly citrus scented. Hosiery wash from hosiery experts - Support Plus. A HARD JOB JUST GOT EASIER - Eliminate bending and struggling when putting on heavy-duty compression stockings and pantyhose. EASY TO USE - Simply stretch the sock, stocking, or pantyhose over the column and insert your toes. 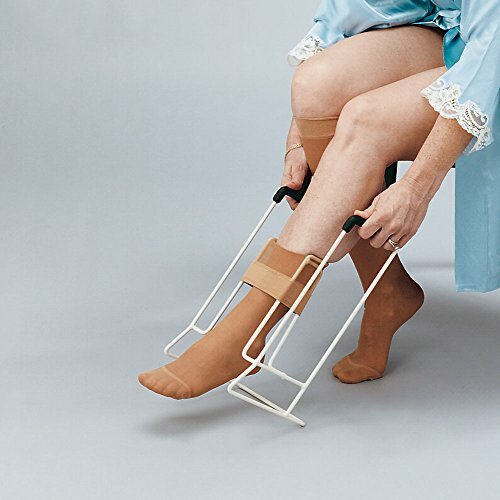 DURABLE DESIGN - This sturdy helper is made of steel and features a smooth plastic coating, making it strong enough for the tightest surgical stockings and pantyhose. NON-SLIP GRIP - Features rubberized handles for a stringer, more comfortable hold. NO RINSE HOSIERY WASH - Clean and refresh your hosiery in 15-30 seconds. Just hand wash and hang to dry, no rinsing required. If you have any questions about this product by BSN-JOBST, INC., contact us by completing and submitting the form below. If you are looking for a specif part number, please include it with your message.